Although I didn't plan on reading these books at the same time, they go together well. One is a memoir, the other a work of fiction. Both tackle significant issues plaguing teens that are affecting our entire country. I Have the Right To is a memoir written by Chessy Sprout, a sexual assault survivor. As I read Chessy's story, I couldn't help but think about my own teen years. Unwanted touching, cat calls, rumors and inappropriate jokes only scratch the surface of how young women are treated when they leave their house. While the big bad world is one thing, your school should be safe. This behavior should not be allowed, ignored or tolerated. Chessy is working to raise awareness and inspire change in schools all over the country. Also included in her book are resources for survivors and information on how to get involved in change. 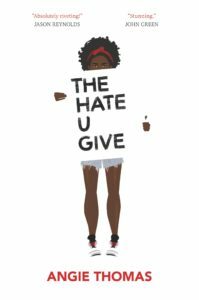 The Hate You Give is technically a work of fiction, but the actions, ideas, emotions, neighborhoods, lifestyles and schools are present all over the United States. Within the first few pages I thought to myself, this is real and everyone needs to hear it. How can things change if so many of us don't know there is a problem? As you read this story, you will remember a news story from a week, a month, a year ago that is hauntingly reminiscent of The Hate You Give. Movie adaptation releases October 19, 2018.